Pema Tsering is the founder managing director of the company born in the far north western valley of Nepal Humla also known as hidden Himalaya the borderland district of Tibet Ngari prefecture or Kailash region. 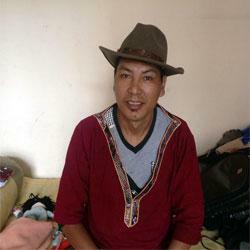 He started his career in tourism industry from very basic the porter in the Himalaya in 1998 as a part time job by keeping his intermediate study a side, having step by step experience becoming Kitchen boy and then Sherpa crew as a field staff of various trips from easy to strenuous trips then he achieved guiding license from Nepal government and temporary guiding permission from China Government for western Tibet. After 4 years guiding service in Nepal Himalaya and around Mt. Kailash region he joined a reputed travel agency in Kathmandu by then he completed bachelor in arts degree in 2001 from Trivuvan University. After having 2 years of administration job experience he found Tibet Holidays in 2003. Within few years Tibet Holidays became one of the leading organization in the field of tourism industry both in Nepal tourism and among Tibetan travel trade. It was now 16 years delivering his wide range of experience in trip operation and monitoring field and administration difficulties. Now he has travelled throughout Bhutan, Ladakh, Many cities in China and Indo China and Xingxiang the silk route extensively. Tenzin Dolker is co-founder of the company. 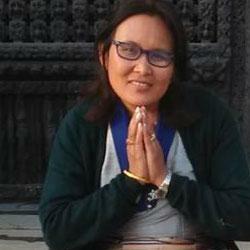 She born in Lhasa and migrated in Kathmandu in childhood. She involved in business of hospitality. She started her career in tourism industry by becoming receptionist in a renowned Tibetan owned hotels in Thamel, Kathmandu and after that she became front desk manager, after having 12 years of expereince in hospitality business she joined Tibet Holidays in 2003. She also worked in different position of social service among Tibetan comunity also. Since inception of the company she played vital role to bring the company in todays position. She is also one of the key person in hospitality management of the company.